ISLAMABAD, MAR 18 (DNA) – There is an emergence of the multi polar and multi-power world, where Pakistan should diversify its relations instead relying too much on a single economic partner.Pakistan should open its doors and needs to work on expanding the CPEC to Central Asia, Middle East and the world in order to reap the maximum economic dividends, which in turn would help achieve strategic stability in the region. Also, there is a need for ensuring internal political and economic stability coupled with improved governance to counter external threats and achieving the goals of strategic stability in the region. Experts stated this during the seminar titled “Corridors in South Asia: A Bumpy Road to Strategic Stability”, organized by Sustainable Development Policy Institute (SDPI) here on Monday at Islamabad. 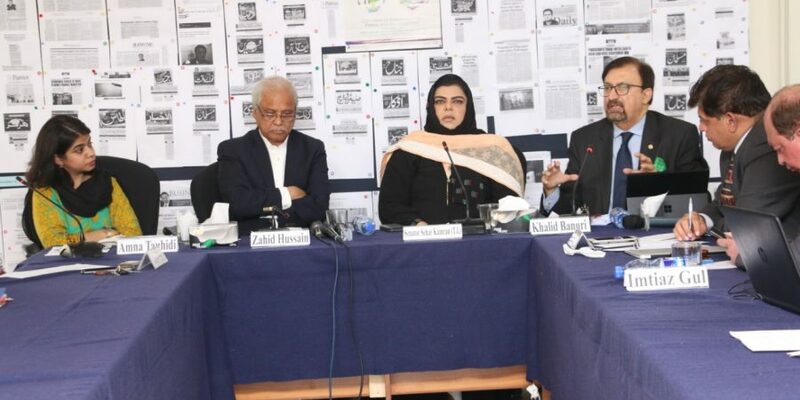 Former Senator Sehar Kamran (T.I) and President, Centre for Pakistan and Gulf Studies (CPGS) said Pakistan is a maritime nation, as around 95 per cent of Pakistan’s trade with the world and 100 per cent oil import is through sea routes. Even though Pakistan has a huge potential, there is complete blindness on the importance of the blue economy. She said we are not the only victim of sea blindness, but also blind on our diplomatic front, where we are failing to present our case to the world. It is unfortunate that we make our mega projects and investments, such as the China Pakistan Economic Corridor (CPEC) and Saudi Investments, controversial through media hype, she lamented. She urged the need for effective implementation of national maritime policy coupled with a comprehensive strategic stability roadmap to counter external threats and achieving the potential dividends of blue economy. Zahid Hussain, Senior Journalist, Author and Analyst said the concept of national security has changed and Pakistan needs to address first its economic, food and environment securities to achieve its strategic security and stability. If we ensure peace, this South Asia region would transform as the fastest growing economic zone of the world. He said to achieve geo-strategic stability we all need to work towards peace in Afghanistan, which is very critical. He said we should be proud of our relationship with China, but we should also realize that China is here because it has its own strategic and economic interest, which we do not understand completely. Khalid Banuri, Former Director General, Arms Control and Disarmament Affairs (ACDA), Strategic Plans Division (SPD) said the weapons, especially nuclear weapons, provide you with some space to avoid conflict, but not a panacea for all due issues. He said Pakistan needs to synergize its efforts, diversify its relations with the world at large and internationalize the lingering issues, such as Kashmir for strategic stability in the region. Amna Tauhidi, Visiting Lecturer, National Defence University & Research Associate, The Centre for Pakistan and Gulf Studies (CPGS) in his paper emphasized the need for evaluating China-Pakistan Economic Corridor (CPEC) from a tri-lateral perspective i.e. trade and economic co-operation, corridors as a geo-political tool and thirdly use of corridors as a strategic tool and its implications for stability in the region. She said this trilateral evaluation will enable the strategy and policy sector to relate to its security and foreign policy objectives. It is unfortunate, that the complex nature of regional architecture in South Asia is more security driven, because of the varied outlook of its stakeholders, she lamented. To make corridors in South Asia a success story one needs to bridge the strategic trust deficit existing between the regional member states, which can be addressed both by global regimes and regional associations, she added.